​Video gaming is a multibillion-dollar industry bringing in more money than movies and DVDs. Parents have a key role to play in determining the nature of their children and teens' video game use, both in terms of monitoring content and the amount of time spent playing them. Familiarize yourself with a video game's content before allowing your child or teen to buy it, download it, or play it on- or offline. Parents and caregivers are often unaware of the content of video games, including factors such as virtual violence and mature sexual content. Studies of children exposed to violent media have shown that they may become numb to violence, imitate the violence, and show more aggressive behavior. Check the Electronic Software Ratings Board (ESRB) ratings. Thousands of video games are available at retailers on and offline, making it hard to learn the content of each one. The video game equivalent of movie ratings, ESRB ratings are a great starting point for choosing games appropriate for your family. They are featured prominently on the game packaging. Ask your local retail outlets to enforce policies prohibiting the sale or rental of "T" (teen) or "M" (mature) videos to underage children. Video games, violent ones especially, have caused such concern that the issue of whether the sale or rental of such games to children should be prohibited was brought before the Supreme Court in 2011. "Video games," the court declared, "communicate ideas – and even social messages." However, the debate continues as real-life tragedies and violence continue to bring attention to the subject. Do not allow video games that are at odds with your family's values inside your home. Explain to your children that they cannot play a new video game until you've had an opportunity to look the product over and determine whether or not it is suitable. It is a parents' choice to implement a personal rating system in their home, even if your child's friends or neighbors choose different standards. A conversation with other parents about your family's rules is reasonable, especially if your child might be exposed to video games that don't meet your standards. Keep gaming in a common family area. Keep an eye on your children while they are playing video games, just as you would if they were using the Internet or watching TV. Consider making any handheld gaming consoles "family property" rather than "owned" by each child. Limit game-playing time to a maximum of 1 hour per day. Time spent playing video games can crowd out time spent in healthier activities, such as exercise, playing outside, reading, or doing school work. Screen time close to bedtime can also lead to disruptions in sleep patterns. 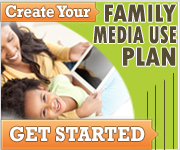 See How to Make a Family Media Use Plan for more information and tips. Encourage your child or teen to choose games that involve multiple players and play with their friends. Technology is a poor substitute for personal interaction. Playing with friends can eliminate problems with harassment, social isolation, and cyberbullying. But, make sure your child's friends play by the same rules expected in your home. If you can't beat 'em, join 'em. Playing a video game with your child or teen will expose you to the lingo of "their world." Multiple player video games within a home such as virtual sports or music activities can also allow siblings and parents to engage in active virtual play together. Have Concerns or More Questions? If you continue to have concerns about your child's video gaming habits or if your child is having difficulty with mood or behavior, ask your child's pediatrician for help. He or she may referral you to a trained and qualified mental health professional.